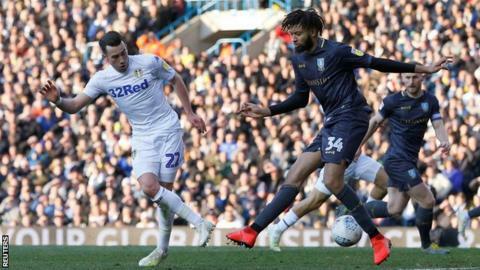 Leeds moved three points clear of third-placed Sheffield United in the race for promotion from the Championship with victory over Sheffield Wednesday. Jack Harrison sidefooted home the only goal, which lifted the Whites above the Blades with four games left, and put them three behind leaders Norwich, who play Wigan on Sunday. Marcelo Bielsa's side dominated the game in terms of possession and chances against their Yorkshire rivals, but had seemed unable to find a way past inspired Owls keeper Keiren Westwood. The Republic of Ireland international produced a string of brilliant first-half saves, twice superbly denying Tyler Roberts and keeping out Harrison's header. Roberts also curled narrowly wide from 20 yards, while Luke Ayling saw a low shot scooped clear near the line by Gary Hooper. Sheffield Wednesday, who are six points off the play-off places after this defeat, did have openings, with Hooper shooting into the side-netting after being sent wide by Ayling's fine tackle, while Barry Bannan forced a save from Kiko Casilla. But Leeds continued to pour forward after the break and Pontus Jansson, Pablo Hernandez and Patrick Bamford all saw efforts fly off target before Harrison's decisive contribution. The home side patiently worked the ball wide to Hernandez, whose low cross was turned past Westwood and into the far corner by Harrison's first-time finish. Wednesday rarely threatened but did go close to a late equaliser when Marco Matias fired into the side-netting. Leeds now need a maximum of 10 points from their remaining fixtures against Wigan, Brentford, Aston Villa and relegated Ipswich to secure their first return to the Premier League since they were relegated in 2004. "A three point lead is not a big difference even at this stage. Things are positive for us right now, but we need to just stay calm and to keep our focus. "There are still important games to do and the job is not done. We were very good in defence and very good in attack today, it was a very pleasing performance. "We created loads of chances, but we need to be more efficient and take more of those chances. We could have made it more comfortable today." "I couldn't fault our effort and endeavour but I don't think there is any question that the better team won. "The transformation in them in the last 12 months is there for everyone to see. They are a very good outfit and their fitness levels and the intensity they play at were too much for us today. "We couldn't cope with it at times and we had the goalkeeper to thank for keeping us in it." Match ends, Leeds United 1, Sheffield Wednesday 0. Second Half ends, Leeds United 1, Sheffield Wednesday 0. Foul by Tyler Roberts (Leeds United). Marco Matias (Sheffield Wednesday) wins a free kick in the defensive half. Attempt missed. Kemar Roofe (Leeds United) right footed shot from the centre of the box misses to the left. Assisted by Pablo Hernández. Attempt blocked. Pablo Hernández (Leeds United) left footed shot from the centre of the box is blocked. Assisted by Kalvin Phillips. Attempt blocked. Pablo Hernández (Leeds United) right footed shot from outside the box is blocked. Assisted by Kemar Roofe. Attempt missed. Marco Matias (Sheffield Wednesday) right footed shot from the right side of the box is close, but misses to the right. Attempt blocked. Fernando Forestieri (Sheffield Wednesday) right footed shot from the right side of the box is blocked. Assisted by Liam Palmer with a headed pass. Attempt missed. George Boyd (Sheffield Wednesday) header from the centre of the box misses to the left. Assisted by Liam Palmer with a cross. Substitution, Leeds United. Stuart Dallas replaces Jack Harrison. Pontus Jansson (Leeds United) wins a free kick in the defensive half. Foul by Atdhe Nuhiu (Sheffield Wednesday). Attempt missed. Kemar Roofe (Leeds United) right footed shot from outside the box misses to the left. Assisted by Adam Forshaw. Offside, Leeds United. Tyler Roberts tries a through ball, but Adam Forshaw is caught offside. Attempt missed. Tyler Roberts (Leeds United) right footed shot from outside the box is too high. Assisted by Adam Forshaw. Substitution, Leeds United. Adam Forshaw replaces Mateusz Klich. Substitution, Sheffield Wednesday. Atdhe Nuhiu replaces Steven Fletcher. Ezgjan Alioski (Leeds United) wins a free kick in the defensive half. Foul by Steven Fletcher (Sheffield Wednesday). Tyler Roberts (Leeds United) wins a free kick in the defensive half. Foul by Michael Hector (Sheffield Wednesday). Attempt blocked. Mateusz Klich (Leeds United) right footed shot from the centre of the box is blocked. Assisted by Ezgjan Alioski. Substitution, Sheffield Wednesday. Fernando Forestieri replaces Gary Hooper. Goal! Leeds United 1, Sheffield Wednesday 0. Jack Harrison (Leeds United) right footed shot from the centre of the box to the bottom left corner. Assisted by Pablo Hernández with a cross. Substitution, Leeds United. Kemar Roofe replaces Patrick Bamford. Attempt missed. Patrick Bamford (Leeds United) left footed shot from the centre of the box is close, but misses to the right. Assisted by Jack Harrison. Attempt missed. Ezgjan Alioski (Leeds United) left footed shot from outside the box is too high. Assisted by Luke Ayling. Attempt missed. Tyler Roberts (Leeds United) right footed shot from outside the box misses to the left. Attempt missed. Pablo Hernández (Leeds United) right footed shot from outside the box is too high. Assisted by Patrick Bamford. Kalvin Phillips (Leeds United) wins a free kick in the defensive half. Foul by Marco Matias (Sheffield Wednesday). Attempt blocked. Kalvin Phillips (Leeds United) header from the centre of the box is blocked. Assisted by Ezgjan Alioski with a cross. Corner, Leeds United. Conceded by Barry Bannan. Jack Harrison (Leeds United) wins a free kick on the left wing. Foul by Liam Palmer (Sheffield Wednesday).